AC/DC is not retiring. Thank god for that. This isn't the first time AC/DC have had a huge mountain to climb. Back in early 1980, Malcolm and his brother Angus (the guitarist from the band who's known for his schoolboy outfit and his shredding solos) were starting to figure out songs for their next album, when tragedy struck. Lead singer Bon Scott had gone out for a night of drinking and partying. At the end of the night, one of his friends left Scott to sleep it off in the back of a car. The next afternoon, the friend came by to check on Scott and found him dead. While he had choked to death on his own vomit due to acute alcohol poisoning, the cause of death, in classic rock and roll style, was listed as "death by misadventure." Hell of a cause of death, right? So why am I telling you about it? Because a lot of people still don't know about AC/DC, and that's a damn, damn shame. 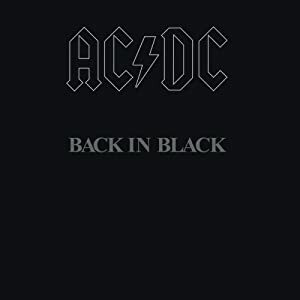 "Back In Black" is the album of a party. It's got everything you need - sleaze, swagger, bravado, a good time and rockin' tunes. Everyone knows the title track, but the whole album is full of great tracks, including the magnificent "You Shook Me All Night Long." Sooner or later, we'll see the end of AC/DC as a band. I think if the band had their way, they would all be on fire on a tour bus that was hurtling into the Grand Canyon while they were blasting "Givin' The Dog A Bone" from speakers loud enough to blow women's clothes off. They'd probably qualify it as "death by misadventure."